I laughed out loud to this entry. Your knitting looks beautiful. I think an extra pattern would make it even nicer. Oh, I like the idea of going down in needle size for the shaping, though I’m not sure what that would do in a colorwork sweater. I just wanted to note that until I’d been crocheting for about a year, I held the yarn in my right hand (and picked up stitches at an odd and not-normal angle – consistently, but still) so you’re definitely not the only one. I find it much easier now that I hold the yarn in my left hand, but I wonder if it comes back to what feels natural. I’m a thrower in knitting, and have a weird method of holding the yarn in my right hand then, so it seemed to make sense when I was crocheting to hold the yarn similarly. That Byrd anthem is fun! I think I tend to get a bit over-enthusiastic at “Blow the trumpet”. I am loving the Little Dorrit. I also never read it so the mystery is killing me. My poor daughter came home for Easter and had to endure hours of Masters Golf Championship with her dad and then the third installment of “Little Dorrit” with her mom. She loves Dickens but not so much when she missed the first two shows. Ah well, glad to find someone else who is anxious for the ending. Sounds cozy and wonderful! I’ve only read the James Herriott books — I’ll have to add the DVDs to my queue. Mmmm… angora. 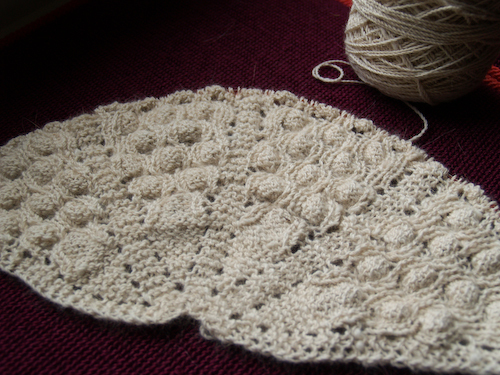 The shawl looks gorgeous, especially since I envision the halo and softness. It wasn’t so much the yarn in the right hand, it was the yarn AND the hook in the right hand that threw me off! 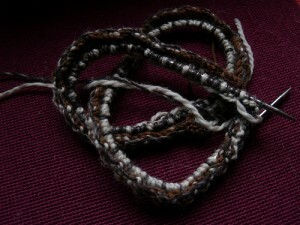 And, funny, I too was curled up on the couch with some knitting in that rain. Guess that’s the only thing to do in a situation such as that. That shawl is lovely! I love how the little cocoons are bubbling up. Have you tried this method of provisional CO: you use 2 different yarns to work a long tail CO. Use your working yarn over your index (to create the st on the needle) and waste yarn over your thumb (to create the bottom edge). No crochet hook needed! Ooo, the evil, slithery French BlancNoir (name?) is so nasty – and quite the actor! If he were real I’d suggest you knit him a gag (something itchy) and handcuffs. Thank goodness no one like that ever showed up on the front porch asking for a date with you. The sweater – bless you – I’d like you to knit the way you feel pleases you most, but is also easy to do. You be the artist, I the happy recipient (and proud Mom). Don’t let it steal time from all the book editing. However it comes out, I’ll try to restrict Sonnet to the bathrobe tie ends. Rain everywhere! I got to do some knitting during our rain shower on Saturday, but only after I got myself thoroughly soaked walking in the rain. I don’t particularly enjoy the cold rain, but I love seeing all the grass coming up green and the buds on the trees after a good rainshower. Interesting decrease dilemma! Good luck. I like the decrease + belt idea but know how tempting hanging ties are to pups. Alas. I too have been trying to knit and watch _Little Dorrit_, having never read the book and feeling very anxious the more evil that Frenchman becomes, and the longer we must wait to find out how these people are all linked to one another. The gray color scheme of city life, plus _Alice in Wonderland_-esque manic character portraits, plus mystery, plus so many wrongs against poor Amy, make very engaging viewing with friends each Sunday night! Almost hard to knit during it — and for me, that’s saying a lot! the belt – toddler- brother thing got a good guffaw out of me. thanks. and looking forward to seeing more of the knitting. looks good so far. happy spring! Wow–that *is* a conundrum. I like the idea of going down a needle size, personally (no worries about visual inconsistency). I agree totally–murky sums Dickens up in a tidy little packet. I completely cheated by coming into Little Dorrit on episode 3 and having my sisters explain all that they had deduced from the previous two. Even still, all those murmuring British voices (and Andy Serkis running around as a crazed French murderer) make it really difficult to keep up! haha! i know my boyfriend is so very glad for a respite from the holy week choral extravaganza! he had rehersals sunday, wed, thu, sang service thu, rehersal and service fri, rehersal sat and a 8am early service and 3 hour regular service sunday! whew! i hope your vocal chords are getting the rest and tea they need! your easter sounds perfect by the way, comfies to wear and loungin! that shawl is looking fabulously cozy, and I’m excited to see what happens with the 3-in-1. belated Happy Easter too.